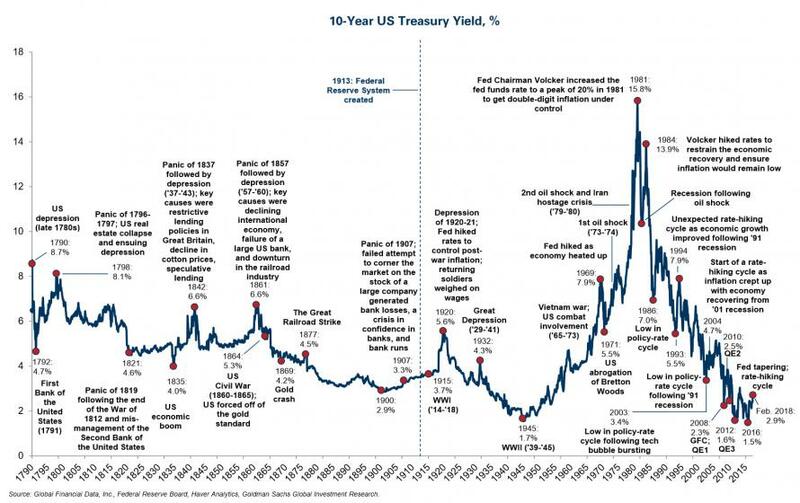 With Dalio, Gundlach, Gross, Greenspan, and Tudor Jones (to name but a few) now firmly in the 'bond bear market is here'-camp, Goldman Sachs has produced a detailed, annotated history of US interest rates... and what happened each time rates spiked. No, the bond bull run is not over. Ten-year Treasury yields have obviously adjusted higher since the lows of September but I don’t believe they are poised to move higher in a sustained manner. There are still tremendous secular disinflationary forces in the world, including worsening demographics, which I view as critically important, as well as the outsized debt burden, both of which will ultimately constrain economic growth and cap bond yields. Of course, cyclically, growth and inflation have increased. But I would think about it this way: Against a backdrop of tremendous historic central bank monetary support, growth and inflation have both finally just come off the bottom. For sure, the economic fundamentals are as good as they have been in a long time - yet 10-year yields are still below 3%. With most forecasters expecting growth to decelerate next year, 2018 will likely mark the peak of this cycle. As such, I’m not sure why investors are so convinced that bond yields will continue to rise. Given where the Fed is headed, investors should remain short the front end of the curve. That is getting more difficult since the market is now pricing in three hikes for 2018, but I think it still makes sense. And then I think you want to be long across the curve, which I expect to continue to flatten due to the desire for duration that I described. That is a really strong technical that, in my mind, will continue, and it’s an important reason why I still find the curve attractive.